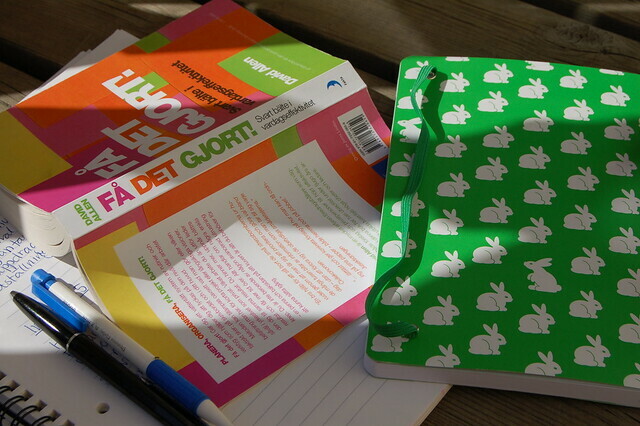 I have bought and read David Allen’s book Getting things done – the Art of Stress-Free Productivity translated to Swedish and called Få det gjort!. This is my review and thoughts about the book. Let me know if you’ve read it and what you think of it, thanks. As I mentioned in my book talk yesterday I bought this book out of curiosity and intended to read it as a reference only, not thinking I could use it. I didn’t discover my need until I started reading and I kind of gobbled each chapter down. There is a lot of great stuff inside this book and I totally understand why it has become so popular and loved! I think it has to do with the fact that it does not only present a functional and complete system for “everything” in your life but it has great psychological insight and explains why things will or won’t work, and helps you get started. Well, I think it will be difficult not to get started at least making a couple of lists after reading this book! I have made several lists and just writing them helps clear the view! Personally I love cataloging things, writing lists, systematizing stuff, taking notes and organizing things, so maybe I should’ve known this would be a great book for me to read. Because that’s what this book is all about. Gathering your piles of stuff; your unsorted papers, to do’s, to fix, to buy, to talk about, to plan, to develop, to sketch out and to write down – and putting them in lists and systems that you check weekly and update regularly! If you, like me, enjoy writing a list every now and then this book gives you material for list-making in abundance! And each list will help you get clear of what you have, what you want and what you should do next! I so love that. Allen prescribes a long term look at your life so that you focus on the right things in the now. This is something we all need to do, with our blogging, our creating, our actions today. Does it take you forward your goals? Do you even know what your goals are yet? If not, writing these lists will help you get a clearer picture. He calls everything we do “work” and that really resonates with me. Not only your payed job is work, but all the things you have in your head that you need or want to do is also some kind of work, because it creates an invisible task you need to check off weather you write it down or not! Allen names everything we do “work” weather it’s a hobby, the maintenance of a home, your family, vacation, your own business or other projects in your life. That’s my take on “work” too, because I can’t separate life from work (ie projects). When you write it all down you empty your head and become (more or less) stress-free. The way he describes this is “becoming like water”, a kind of list writing-meditation that I totally get and want to embrace. I listed my private creative projects in one huge list and then made the distinction between “ongoing” and what Allen calls a list of Maybe/Sometimes! The Maybe/Sometimes idea is fantastic because it enables you to write your future projects down without getting stressed about them in the now. They are on that list for a reason, and they are not to be worked on right now. They are not even a commitment yet or a promises to yourself – they are on the maybe-list still. I love how that gives you permission to dream big for the future. Any regular to do-list is renamed The Next Action and it is separate from your 1-5 year achievement list, your Maybe/Sometimes-list and your Projects going on right now-list! This is maybe the most important lesson in the book, to define and understand “next action”. What a revelation that was to me to learn about this different, it is something I haven’t understood before. I had a look at my own to do-list and understand now why some lines stay for so long! Hehe. Don’t put “Have a clean house” or “Create interesting blog”, instead write “Fold and put away the clean clothes” or “Write a review that shares some of the nuggets of the recent book you read”. Some things in this book is defiantly not for me and some seams to be overkill for most people, like listing “things to discuss with your family”!? But one can apply the techniques that feels interesting and not do the others! That tells me these are good organizing techniques. For me this book has opened my eyes to the fact that I had over 3000 e-mails in my inbox (dating back to 2005)! I have noticed how unproductive I often am and that is certainly something I want to change. Making lists of ordinary things can be eye opening and reveal the craziness of your life. For example, I have made a list of books that I have visible on my bed table waiting to be read: and there are 22 book there right now… No wonder I feel I don’t read enough, and am not getting anywhere with my reading. But the list makes me want to start reading, sorting and ticking those books off right now! As many of you know I’ve got lots of creative projects going on at once and I, like many of you, get overwhelmed with ideas, inspiration and want-to-do-right-now-thoughts. It can be paralyzing to have this many ideas all the time, so organizing is crucial! This book is applicable to all those projects, ongoing and those in my mind. Having them on different pages in my notebook really helps. I didn’t know I need this book, but I just needed to start reading it to get inspired. You know how some books just sparkle and makes you want to take action right away? This book makes you want to jump up and go, go, go! Organize! Plan! List! Fix up my life like a little bunny on turbo speed. 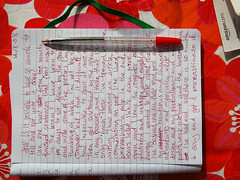 So far I’ve written some lists, moved all the e-mails from my inbox, got myself a green notebook to write or sketch out blog posts (on the bus or train station when I can’t surf or type), and I have removed the link to “check comments” on my blog that I constantly click, and replaced it with a direct link to my “write blog post” page in the admin! I hope that will help me focus on what’s important for a blogger hehe, so far it’s working nicely. I ‘ll get back to this subject in later posts too! This entry was posted in Book Reviews, Digital Life, I write Lists, Thoughts on Creativity and tagged GTD, planning. Bookmark the permalink. sounds like a really good book! i also like books that inspire me to take action in that way. Thanks for the recommendation! I’ve reserved it from my local library. Thanks for this! I am always so busy multi-tasking I have a really hard time getting things done. Thanks for sharing! having a lot of e-mails stored is not problematic for me either, the problem is probably that I check them and don’t answer them and then the important ones keep going deeper and deeper into the pile and disipears! I get so much e-mail notices and stuff that I need to be more organized to know what’s important and what’s not! I don’t know yet how to manage it but I’ll figure it out while I go along! Any mess is not disturbing perhaps if you are always sure of what is important to do next. I’m not. I get sidetracked ALL the time! How about you? Thanks for your comments girls! My husband loves this book and introduced me to it, and I often implement parts of it to try to keep myself productive. I’ve found it helps a lot with fighting my tendencies to get overwhelmed by all my ideas and projects and interests. Hey hanna, my hubby is reading the exact same book at the moment ;-) he says that i provides great tips for multi-tasking. Thanks. I have a few people in mind (myself included) who may benefit from reading this book! The website 43folders.com has been talking about GTD since 2003 or so. Specially interesting are the articles on managing email. I would also recommend “Time Management for System Administrators”; although it is targeted at SysAdmins, it has many practical advises, and it takes advise from many other books, including GTD. GTD is a lot for the “big boss” (who here has an assistant?). TM4SA, otherwise, is more for the person having to do everyday work in many projects. PS: “I get overwhelmed with ideas, inspiration and want-to-do-right-now-thoughts.”—I could have written this! I love this book!! I totally identify with Allen’s notion that everything is work. It seems like when I leave the office, or “work” for the day, my time at home can be just as stressful. I am still stuck in my old ways, but GTD is helping me overcome them. Thanks for mentioning this Hana, and I would def recommend this book to anyone! I just found your review of this book…better late than never! :-) I hope my library has it as I plan on reading it. I too love making lists, any kind imaginable. I have lists in so many places that I forget where they are and what was written on them…lists outlining who I need to call, items I need to buy, projects to be completed, things I want to accomplish in my home and in my life. Also, I was happy to read you had over 3000 emails in your inbox dating to years past. I have the same dilemma and even though the thought of so many emails drives me crazy, I don’t do anything about it. I definitely need this book! Thank you for the well-written review.